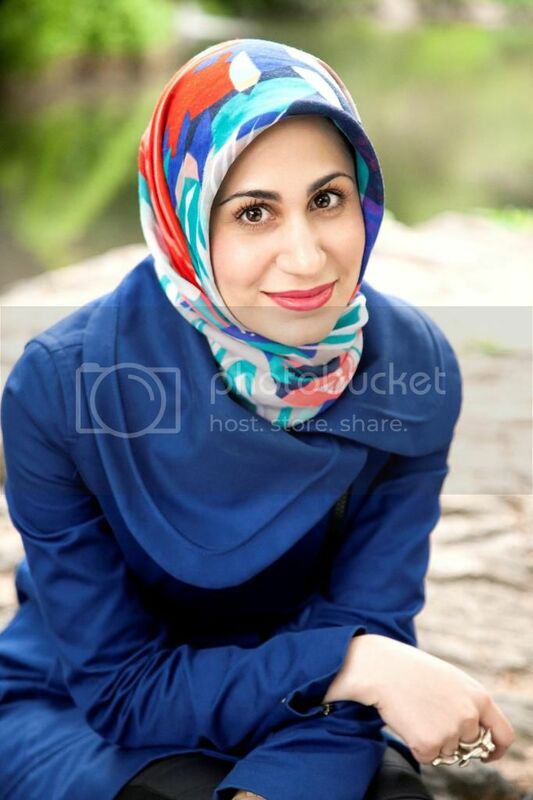 Now it’s not often that American authors are able to cross the pond to my poor little country to promote their books, so imagine my surprise when the awesome and hilarious author Tahereh Mafi announced her plans to visit the Netherlands. I read her book, Shatter Me, back in March (before I started writing reviews, sadly, so I can’t share that with you) and gave it an unquestionable five stars. I absolutely loved it, so knowing about her visit, I eagerly followed the Dutch publisher (Blossom Books) to see how I could meet her. Luckily I won a Meet & Greet on November 27th, so I have a great interview to share with you. And considering that it’s my first time meeting an author, who is absolutely and unquestionably awesome, and my blog has survived its first month, it’s time for a giveaway. is what I don’t tell him. is what I’ll never tell him. is what I want to tell him. We started the Meet & Greet by going around the room and having everyone introduce themselves. Tahereh laughed at my Twitter handle, with which I had talked to her a couple times before. I felt like a dud, being one of the oldest in the room and the only one with the English version of the book (also with the old cover). But it felt like everyone was really nervous at first, we were all really shy with asking questions. However that gradually went away, and before we knew it the 45 minutes were up. She gave some great insights into her writing process, and her development of the series, which was wonderful to hear (and I hope you’ll enjoy to read). We took some pictures with Tahereh and then had our books signed (she was impressed by my English, haha), and finally (and very, very sadly) said goodbye. 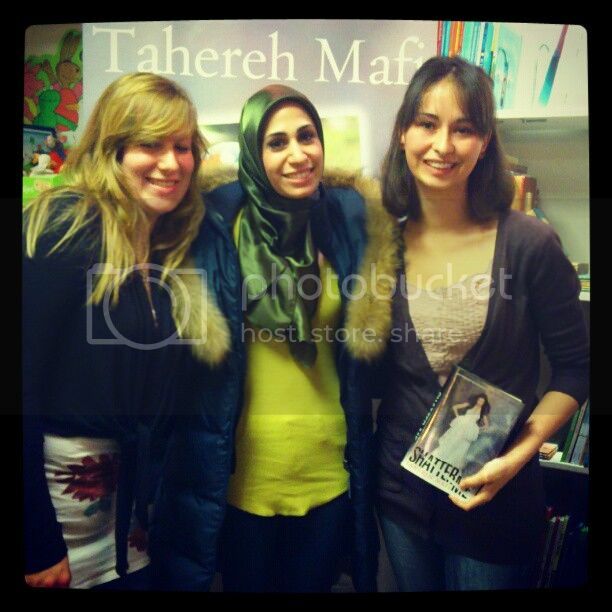 My friend Nathalie, Tahereh, and me & my lovely, beautiful signed book. Tahereh Mafi: (about Juliette and her unique writing style) It’s just you vs. the world. And so everyone’s telling her that she’s this awful person and she just wants to believe that there’s hope. Like, maybe she will find love, and maybe she’s not such a bad person. So there’s a lot of doubt in her mind, and there’s this self-censorship going on, where she wants to believe something, but then she’s afraid to. Or she’s thinking one thing but she says another. And so, the strike throughs just sort of stemmed from that. I wanted it to be – a lot of the things in the book, the way that it’s written: the prose, the numbers that they’re numerals as opposed to being written out, or the things that are repeated constantly, the way that there’s abrupt breaks in sentences and there’s like one sentence paragraphs or things that should be spaced out differently, or there’s weird punctuation… I wanted it to be a visual representation of the craziness going on in her head. So I wanted it to be more than just me telling the reader, “She’s crazy!” I wanted it to be like, look, in her words, the way that she writes and the way that she’s telling the story, it’s very visually connected to the way that she’s thinking and feeling. And as the series progresses, you’ll notice in the first book the strike throughs are a lot heavier in the first half. And as she sort of comes into her own and starts talking more and meeting more people and interacting with the world a bit, the strike throughs lessen. And in the second book it’s the same way, the strike throughs are significantly less, and by the third book they’ve almost completely disappeared. And the prose is the same way. The first book, it’s kind of over the top, very scattered, and kind of fractured, very metaphorical and doesn’t make a lot of sense certain places. A lot of things are repeated. And the second books gets a little more coherent, a little clearer. And then in the third book, it finds a sense of normalcy. And that shows again that psychological torment. Q: Yeah, I was writing my own book, but I had a bit of a struggle with finishing it, so did you struggle too? TM: Yeah, absolutely. People always ask me what the hardest part of writing a book is and I’m always like, “WRITING A BOOK.” It’s really hard. Like… The beginning is hard, the middle is hard, the end is hard, putting all of it together is hard, editing it is hard, liking it is hard, it’s all hard. But if you’re a writer, you write because you love it, because you live for it, and you can’t not do it. If I could give any aspiring writer advice, it would be, first of all, super cheesy, to never give up. Because, I genuinely believe that the only difference between a successful writer and an unsuccessful writer is time. I mean, you just have to hang in there. If you hang in there long enough, if you push through long enough, if you write enough, you’re gonna get somewhere. It’s just a matter of time. And also, don’t be afraid of writing a bad book! I wrote five manuscripts before I wrote Shatter Me and they were all bad. And I still don’t know if Shatter Me is any good, but I mean… or *laughs* Vrees Me [the Dutch title]? I don’t know, I mean, it’s a process. Everything you write teaches you something. The first book I wrote taught me I could write a book! I mean, it was terrible, it was really bad, it’s like embarrassingly bad. Like, I would never let anyone read that. But it gave me the confidence to believe that I could actually finish a book, which is kind of a huge thing. I mean, it’s a lot to write 500 pages, even if it’s complete crap. I mean, it’s still kind of an accomplishment, I mean, I sat down at this desk and wrote A LOT. I mean, 100 pages is a lot. Especially for all of you, I mean you’re so young. To be able to do something like that at your age is pretty incredible. At any age, truly. To have the patience to sit down and do that. So it’s all incredible. It’s all something that you should be congratulating yourself for. And when you get through that… The first book taught me that I could actually write a book. The second book taught me how to edit a book, like to edit as I write: to understand that you can’t spend 10 pages describing someone’s outfit, ’cause what does that have to do with anything? That doesn’t move the story forward. And so you learn to edit as you write. Then the third book taught me how to write a little more eloquently. The fourth book taught me how to put all those things together. The fifth book taught me how to put them together… kind of okay, like to learn how to do that kind of thing in a way that was acceptable. And then by the time I wrote Shatter Me I sort of took all those rule and broke them, because by the time I figured out how to write a book, I was like, “Okay… I’m just going to throw all that away and do something that I like, and I’m just going to be true to the voice.” For me, I felt like I was really constricted by convention. I was like, I really want the character’s voice to be authentic. If I’m writing about a crazy person, I want it to sound like a crazy person. Like, why should I have to write like a normal person to describe a crazy person? It seems like an extra step. So, I just thought I would take a risk and see if it works out. But I first had to understand how to write a book. I just finished writing the third book in the series in June, I’m in revisions now, and as I was writing that book I thought, “I think I finally understand how to sort of write a book, but I’m still not really sure…” Because, I’m working on something new now and it’s the same thing. Every time you sit down at that desk and you’re faced with a blank page, it’s hard! It’s the same circle every single time and it doesn’t get easier. But you do learn to deal with it in different ways. So you have to always push through. It’s difficult even for writers who have written 50 books. It’s still hard. So if you’re ever writing and you feel like you’re hitting a wall, just remember you’re not alone. It happens to everybody. But you can’t edit a blank page. If you have a bad manuscript, you can edit it, you have content to work with. But if you don’t finish it, it’s just a shame. So.. that was a long answer. Q: Do you read the reviews of your books? It’s a balance between trying to be true to how you know the series has to develop and how your characters have to interact with each other and where they’re going to end up… So you have to balance what you know with not wanting to break the heart of your readers. Because I think it’s incredibly selfish as an author to say that, “I’m going to write the story the way I need to write it and I don’t care what anybody else thinks.” Because I think that’s kind of cruel when you’re selling your book and you’re sharing it with other people, you’re saying, “Here, I want you to take part in this with me.” I think you do have to take into account the fact that people are becoming mutually invested these characters… and I’m a reader! I know exactly what it’s like to read a series and be so angry about how things end up that you just want to throw the book across the room and go punch the author in the face! I totally get that. That’s kind of how I felt when I finished Mockingjay… After I read Mockingjay I was just a wreck. For two weeks I was like, “I’m not okay… Life is not going to be okay…” I was just heartbroken. I was just like, why… why would you… I TRUSTED YOU!!! I mean, I was legitimately upset. And then I was like, I don’t think I could ever do that to people… I hope that I never do that to people. The way that I felt, I mean, I felt sick to my stomach. I still love the series, I’m a huge fan of The Hunger Games, but I think that was the problem – I loved those characters so much and then I was like, “Peeta!! !” [audience: Finnick!!] Oh, god, Finnick… Finnick deserved so much better. But my point is, it’s really difficult to balance doing what you think is right for the characters and doing what you know that your readers want. And I think that if I read too much, about the positives and the negatives, it just messes me up. And I also think that all people but definitely writers are especially sensitive: the creative, artistic type. I think we’re very sensitive about feedback because it’s so personal. Everything you create as an artist is something that comes from you. You’re not building a machine that has no real emotional connection to you. You’re writing a book or you’re painting something or you’re taking photos with your heart and soul. So when people criticize that, you take it as a personal offense. And all you hear is buzzing around your head when you sit down and write. And I think that’s really dangerous. We don’t remember the positive things. It’s always like, “Oh, I’m a crappy writer, I should go die.” And not like, “Oh, my book got published. That’s pretty cool.” [laughter] So, it’s difficult. So I decided to stop reading reviews a long time ago. Me: Can you tell us anything about what you’re working on now? Me: Well, I’ll be excited. TM: I’m excited to be working on something different, not that I don’t love these characters. But I really do feel like, since I finished writing the third book (though I’m still working on some pretty extensive revisions) I feel like I’m pretty positive that the heart of what I’ve written so far is going to stay the same. I know what’s going to happen: how it’s going to end, how it’s all going to go down. And I feel really good about it, so I feel like they’re my children. And I’ve been like, “Listen, I’ve given you a good life. And now you’re going to live it and you’re going to be okay. Some of you. Most of you. Something like that.” [laughter] And so it makes it easier for me to move on and write other books. So I love these characters, but I’m excited to enter a new world and to get out of the head of a crazy person. Q: Was there a lot of pressure when you wrote the first book, that the second book has to be as good as the first one? TM: I think there’s always that pressure! Even from ourselves, you always want the second, whatever we write next, to be just as good if not better than the first. But I never felt that kind of pressure from my publisher. But writing the second book in general, in a series, is especially difficult. I should actually be more specific. If it’s the second book in a trilogy, I think there’s a special sort of difficulty to it. Because it can’t quite be the finale, and it can’t be the beginning where everything is happening. But it has to stand alone as this really exciting book that has a beginning, middle and end, and is really interesting and still moves the plot forward without being a really boring bridge book. You know a lot of second books are like, “And they just kept walking,” for 500 pages “to get to the third book” (metaphorically speaking). Like nothing really happens or it’s kind of like, “Why did I spend 20 bucks on this? It’s really lame.” And I never wanted anybody to feel that way. So that kind of pressure I felt, for myself. Because most second books don’t really do a lot for me, as a reader, I’m not really wowed by that. So I really want this to be a book that stands on its own and has a lot happening that really pushes the story forward. It’s a lot longer than the first book… and a LOT of stuff goes down. It is like.. emotional revelations! And lots of… STUFF. I think it’s super intense and when I wrote it I was like, “This is the best thing I’ve ever written.” I was like, “Finally. I feel really good about this.” This was after I wrote the first draft and my editor was like, “… No…. this isn’t going to work…” [laughter] And then I was like, “Oh, no….” and then I had to edit pretty substantially. And then after that grueling process I was like, okay, I think it’s ready. So I’m really excited about the second book. I think it really takes things up a notch from the first book. I hope you guys like it. It’s coming out in February! Q: I’ve already read it. Q: Yeah, I was an intern [at Blossom Books]. It’s amazing. TM: Have another cupcake! But thank you, I’m glad you liked it. Q: Did you write Destroy Me before or after Unravel Me? TM: I wrote it after. Q: Because I read first Unravel Me and then Destroy Me, but I think the story is… you understand it more, some parts, if you first read Destroy Me. TM: Yeah, I agree completely. I never intended Destroy Me to be part of the series. My publisher actually came to me wanting me to do a promotional piece for the series. Because the first book came out in November 2011 and the second book isn’t coming out until February 2013. So there was kind of a big gap between the two books. And they wanted me to write something that would tide readers over until the second book came out. Something that would be used as a publicity piece more than anything else, a marketing tool. And it was just supposed to be like 30 pages or 50 pages, something like that, and it was going to be an e-novella. And they asked me to do a prequel, like bonus content, like write something that came before the story started, like about Juliette’s childhood or something from Kenji’s perspective. And I was like, that sounds really lame. [laughter] I don’t want to write that, like what a waste of time. And who would want to read that? I wouldn’t want to read that. Juliette’s childhood was super depressing. And Kenji, before he met Juliette, had nothing really relevant to say. But after I wrote it, I thought, this is actually really important, I want everyone to read this. I feel like people need to read it in order to understand Warner, because he plays such a big role in the story. He’s the central antagonist, and kind of a villain, and he does some really terrible things, but nobody knows why. Nobody knows where he’s coming from, nobody knows his backstory, because again, you’re seeing everything from Juliette’s perspective. And she’s terrified and angry and thinks he’s a monster, so that’s the image you get. So yeah, I wrote it after Unravel Me but I think it’s really critical in understanding the entire story. So I hope you guys like it! And I’ve been telling everyone this, but it’s so crazy seeing this printed, because in the US it’s just an e-novella, it’s just online. And I keep petting it. Because I love this cover! And I never thought that I would see it printed in hardcover! And then Myrthe [representative of Blossom Books] is just amazing. She’s like magic. She picked me up at the airport, and was just like, “Here!” I was like, “WHATTT is happening?? ?” And now I’ve been touching it every chance I get. So I’m really excited. Nobody has it like this. They printed some editions of Destroy Me in Sweden as well, but they have their own covers. And this is just like the American edition. And nobody has this anywhere. And everyone in the US is like, “What the hell??? That’s so stupid! !” and I’m like, “I… I dunno… Don’t hurt me!” So, anyway. Q: When you made the decision that Adam should be able to touch Juliette, did you already immediately decide that Warner also should be able to touch her? Or was that random, just sprung up in your mind or something? TM: I actually didn’t make any active decisions like that. I didn’t think about it beforehand. I was just writing the story and I was like, “Oh, well, I guess he can touch her now…” [laughter] And then I was like, “There must be a reason for that..” And then I was like, right, and I figured that out. When I write I like for things to be really organic and dynamic, so I always have a general idea of where things are going but I never plot it down to the specifics. I never think like, “And then this is going to happen, and then this is going to happen,” even though the books are actually very intricately connected and everything is important. Everything is representative of something else. Even that bird, the tattoo, it’s very significant. It has a huge significance that you actually don’t find out until the third book, that is probably not what you expect at all. And even Adam and Warner, the fact they can touch her, there’s a totally reason behind that. It’s not an accident, it’s not coincidence. It’s pretty complicated. And so, there’s an explanation for everything. So it’s cool, it’s fun to write. So, after I wrote the first book and it was finished, I was staring at it, I was like, I know pretty much where this is going to go. But it wasn’t until after I really finished putting the initial pieces together that I was able to put the rest of the series together. Actually, I’m probably giving you a very skewed perspective of what an author’s process is like. [laughter] Because I’m kind of not standard… Most people have a pretty good idea of what they’re doing when they’re writing. But the interesting thing about writing is, and I always say this, is that I love that there’s no right or wrong way to do it. As long as you write the book that means you’re doing something right. Like, if you manage to finish it, you could write it upside down, hanging from the moon, and it would still be the right way to write a book. And no one can tell you otherwise. So if anyone ever does try to tell you that there’s one specific way to write a book, it’s complete nonsense. And they’re probably very mean people, because why would you say that to anybody? Because if you try to write the way somebody else does it may not work for you. And it might discourage you, and that would be really disappointing. I feel like I’m answering like 15 questions when you’re asking me one specific question. [laughter] I’m really sorry..
Q: We like hearing you talk. Myrthe: Yeah, for me, not for you. Me: Since you had such an organic writing process, did you ever have writer’s block? TM: No, I actually think writer’s block… it’s a very real thing, when you’re stuck and you can’t write anymore. But I actually think it’s not like a general, “Oh I have writer’s block, I can’t write today.” I think it has to do with something you’ve done. I think if you’ve reached a point in writing a manuscript where you find that you can’t really move forward, and nothing you’re doing is really working, it’s usually because you’ve forced your characters to do something that doesn’t feel natural to them. You are forcing the story to go in a direction that isn’t right for the story. And I found that whenever I look back at the last paragraphs that I’ve written and really think about it and ask myself, “Honestly, does this make sense, the direction that I’m headed in right now, or was I trying to force it do something because I was looking for a shortcut or because I wanted them to do something but it doesn’t really seem natural to them?” And every time I’ve gone back and readjusted some things, it was like removing this huge road block, and I was able to keep writing again. So I think it’s more than just a mental block, I think it’s because you’ve reached a point in your writing where you need to re-examine the direction you’re going in. But yeah, definitely. Definitely. Q: Not really a real writer, but I’ve written fanfics and stuff..
TM: Nice! What makes you not a real writer? Q: Well I haven’t really been trying to write a real book to get published, but I love writing in and of itself. TM: That’s great! I think that makes you a writer. I think if you think you’re a writer, then you’re a writer. You don’t need credentials, which is really cool. You don’t need to go to school for it. You don’t need a degree. You don’t need to take any formal training, go to any classes. Your mom doesn’t have to like it. Nobody has to like it. You can do it anywhere, at any time. The only problem is, you usually don’t get paid for doing it. [laughter] But that’s okay too. But anyway, that’s great! Myrthe: Do any of you have any urgent questions that you must know the answers to? We have about 10 minutes left. TM: Or I could just here and ask you guys questions. Or we could just stare at each other. Me: Have you tried Dutch food yet? Others: Like a kroket? Or an oliebol? Or stroopwafels? Or pepernoten? TM: *comes back* Are you talking about me? Oh, that was so gross… I was like in front of all these kids, and they were like, “Here! Try it!” and I was like, “*GULP*” I seriously almost threw up. It was really embarrassing. I was like, “Guys, it’s great, thank you!” *pulls out stroopwafels* This is blowing my mind! Me: Stroopwafel, a syrup waffle, literally. TM: There’s like, caramel in the middle. Q: It’s even better when it’s heated up. Q: Yeah, if you have a cup of tea, you can put it on top of the cup and it gets warm. TM: I have like one day left in Amsterdam, so do you guys have any suggestions for food? Myrthe: It’s like the St. Nicholas treat, the small, round cookies. We have them here. TM: Is that what they gave Ransom yesterday, like the spiced cookies? Q: Here, we have some. TM: *tries one* … … This isn’t awkward at all…. Umm, it’s very good! TM: Great! …I thought that was dog food. …It’s really good, thank you. TM: People keep offering me things, and I keep trusting you!! You know what, I have these. *clutches stroopwaffels* Does anyone else have a question? TM: Oh god! You weren’t kidding. An actual letter. This is amazing. I just got a mug today that had tulips and a windmill and clogs and two people kissing on it. I’ve now come to recognize this as the Netherlands. Can I open it? … You’re totally going to make me cry. This is so beautiful. Bedankt [Dutch word for thank you]! This is so sweet, thank you so much. TM: Good luck with your stories! Q: I’m still waiting for that letter. TM: Yeah, right? I’m like convinced that it was just lost in the mail, so that it will show up soon. So Harry Potter, because that was like my life. There was no real young adult fiction when I was growing up, especially not in the US, and Harry Potter was like all I had. And when Harry was 10, I was 10, when he was 11, I was 11. I started reading those books when we were the same age, so it had a huge impact on my life. I really, really loved those books. That series really stayed with me. But I’m also a huge fan of the classics. I love Jane Austen, I feel like a lot of people misunderstand her. They think that she just wrote these silly romances, but she was making fun of everyone and nobody knew! And she was basically criticizing society and making fun of all the stupid things that people did. And she’s brilliant, and I love her. But the best YA novel that I’ve read recently was actually Ransom’s book, which I LOVED. It’s really beautiful. It was kind of awkward. Because he and I are friends and his book is like a huge bestseller in the US. And the more I heard about it, the less I wanted to read it. And I was like, he’s probably not interesting, and his book is probably terrible. Which is a really mean thing to think! But I was just like, “Oh, it sounds stupid.” Don’t tell him I said that. [OOPS!] And then I met him and we became really good friends, and I was like I should probably read his book. And I did, and I really loved it. But I was really worried that we weren’t going to be friends, because I was worried I was going to hate it. But it was really, really lovely. So if you get a chance and you’re looking for a good YA novel, it is awesome. And it just came out in Sweden! …AND in the Netherlands. [laughter] Sorry, I was just in Sweden. I’m getting countries confused. Q: Do you listen to music while you write? TM: I generally listen to music before I write, to sort of switch gears and set the tone for what I need to do. I have these noise-cancelling headphones that I wear that also work as regular headphones. And I like cinematic music to sort of set the tone of this dark, dystopian world. And then while I’m actively writing, I can’t really listen to music. But I go to this website called rainymood.com. It’s just great, the sound of rain and thunder. Because California is so sunny! [laughter] And I’m writing about this dark, bleak, dismal world, and it’s really annoying. I was writing the third book in the summer, and it was like June. And my window is like right next to outside… that makes sense… of course my window is next to outside. [laughter] My window is right next to a pool and people were like happy and running around and splashing in the water and playing with balloons. And I was like, “This is ridiculous!” I need depressing things. And California was not helping. So I put on my headphones and pretend I’m in a dark, sad, lonely place. And then I shower after I get out of there and re-enter the world. So that helps, the rainy mood thing helps. Tahereh Mafi is a girl. She’s 24. She was born in a small city somewhere in Connecticut and currently resides in Orange County, California, where she drinks too much caffeine and finds the weather to be just a little too perfect for her taste. When unable to find a book, she can be found reading candy wrappers, coupons, and old receipts. SHATTER ME is her first novel. Foreign rights have sold in 22 territories to-date and film rights have been optioned by 20th Century Fox. Her work is represented by Jodi Reamer of Writers House, LLC. Now, if you sat through all that, you definitely deserve a reward! No, really, I just want to share this amazing book with more YA fans. It’s definitely worth checking out. I will give one lucky international winner a copy of Shatter Me. You must fill in the Rafflecopter below to enter. The giveaway is international (as long as The Book Depository ships to your country). You must be 13 years or older to enter. Any entrants who are found to be gaming the system will be disqualified. This contest runs until December 20th, 2012. When the contest ends, the winner will be announced here and emailed. The winner will have 48 hours to respond, before another winner is picked. I am not responsible for items lost in the mail. Hahaha, I’m glad you enjoyed it 🙂 Tahereh was absolutely hilarious and a wonderful person to meet. Aww, I’m glad you enjoyed it 🙂 I hope I get to meet tons of authors in the future, they all just seem so cool and have these really great views on the world. Hahaha, I totally know what you mean, that scene is one of my favorites too xD Team Adam all the way! I’m not entering the giveaway as I own a copy but I wanted to comment on your post! What a wonderful post! I absolutely adored the interview. You presented it with such a personal feeling. Great job! 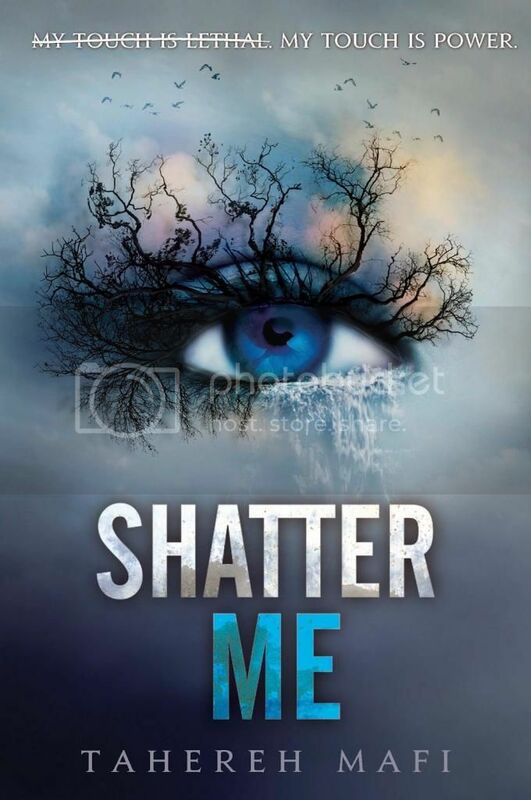 I totally loved Shatter Me. One of my fav. reads of all time. 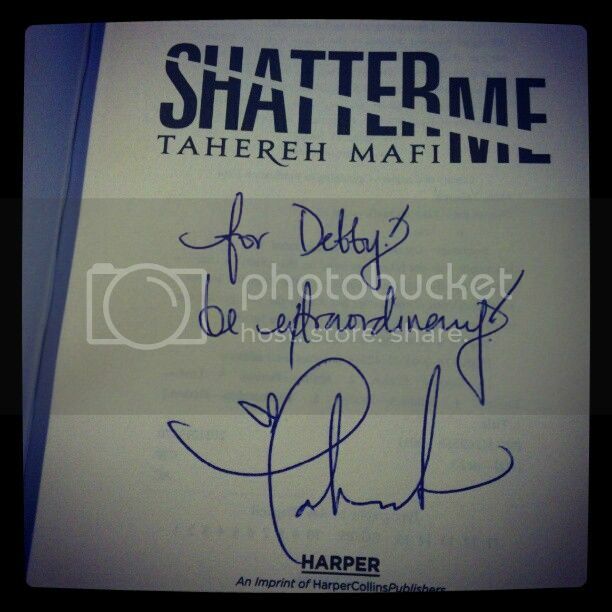 And I really adore the way Tahereh Mafi interacts with her fans. Yay for such an epic win for the meet and greet! I wish that authors would come close to where I live, but sadly, never happens. I tried to follow you via email so i don’t miss posts, but it says “The feed does not have subscriptions by email enabled” =( Thanks for sharing! Aww, thank you! I’m glad you enjoyed it. and I’m glad you agree about the awesomeness that is Shatter me 🙂 This was such a great experience but yeah, sadly most authors don’t come by here. But I will keep my eyes open for any other YA authors in the area, haha. Sorry about that! Feedburner confuses me. I just messed with the settings and tested it and I can follow myself (lol, YAYYY) so maybe if you try again? 🙂 thanks for trying anyway! I love the lyrical way Shatter Me is written, and the crossouts really add a compelling effect to the character and the prose. I haven’t read shatter Me yet, but I love reading dystopian genre. Aww, I hope you check it out regardless of whether or not you win, it’s such a great read 🙂 It’s not a typical dystopian, but it’s just as (if not more) beautiful. I haven’t read it, but I’m a huge sucker for anything and everything dystopian, and this is supposed to be one of the top-tier ones. Well it’s not a typical dystopian but it’s so uniquely beautiful… I hope you check it out, whether or not you win the giveaway 🙂 Thanks for stopping by! Oh I absolutely adored reading this interview 😀 It’s so cool that you won the Meet & Greet, and Tahereh Mafi is hilarious! I really wish I had been able to go, but at least I got an autograph 🙂 And I CAN’T WAIT to read Unravel Me!!! Yay, I’m glad you enjoyed it!! It’s really too bad you couldn’t go. It was such a once-in-a-lifetime thing.